A Fly Press is a machine tool used to shape sheet metal by deforming it or cutting it with punches and dies. The punch is usually the top (male) tool and the die (female) bottom tool. It can frequently be used to punch holes in sheet metal in one operation, rather than by cutting the hole by slower drilling / milling operations. If used for piercing holes in sheet metal work, the fly press tool itself consists of a punch and clearance die, into which it just fits. This type of set up is know as open tooling as the punch and die are separate from each other. This is the cheapest tooling system, most flexible but the hardest to align perfectly for burr free piercing in sheet metal. If the punch and die are permanently fixed within a die set they are then perfectly aligned each time the tooling combination if put in the fly press. This die set system is more expensive but longer lasting over the life time of the tooling. 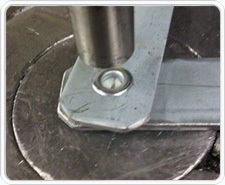 The exact alignment of the top and bottom tools is essential to prevent excessive burring on the underneath (die side) of the finished sheet metal work. 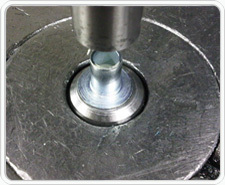 The amount of die clearance is defined by the material type and gauge. 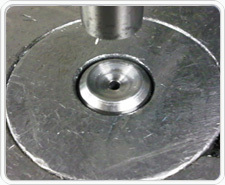 The thicker the sheet metal gauge being pierced the larger the clearance distance is needed between the punch and die. It’s worth looking at our webpage on punching for more details on the mechanics of punching a hole through a sheet of metal. Both the punch and die are usually machined, ground and then hardened so that they can withstand the forces required to punch through the hardest of sheet metal components including stainless steel. 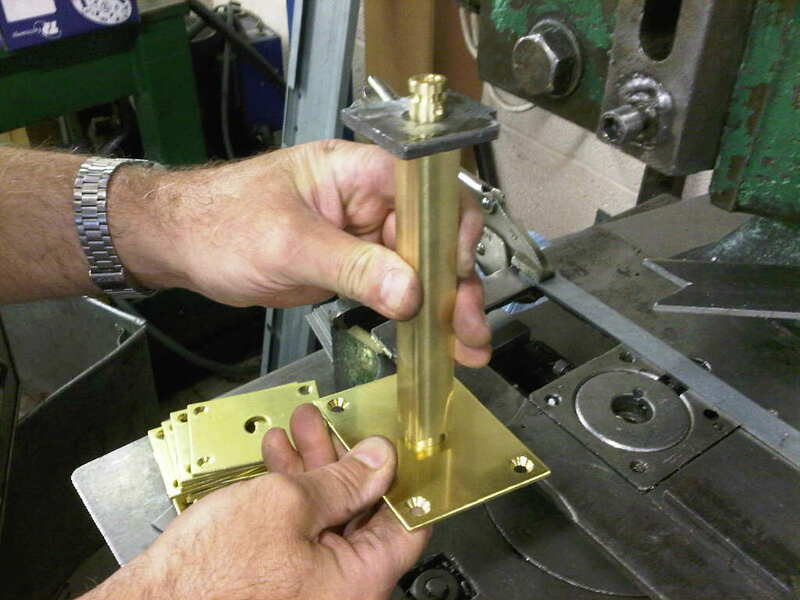 The sheet metal work piece is positioned between the fly press punch and die, and the machine is operated or stroked. The punch will cut through the material in one continuous movement by shearing it. The punch tool can often have a shear angle ground onto it to help reduce the force required to cut through the sheet metal and help reduce the noise in production. 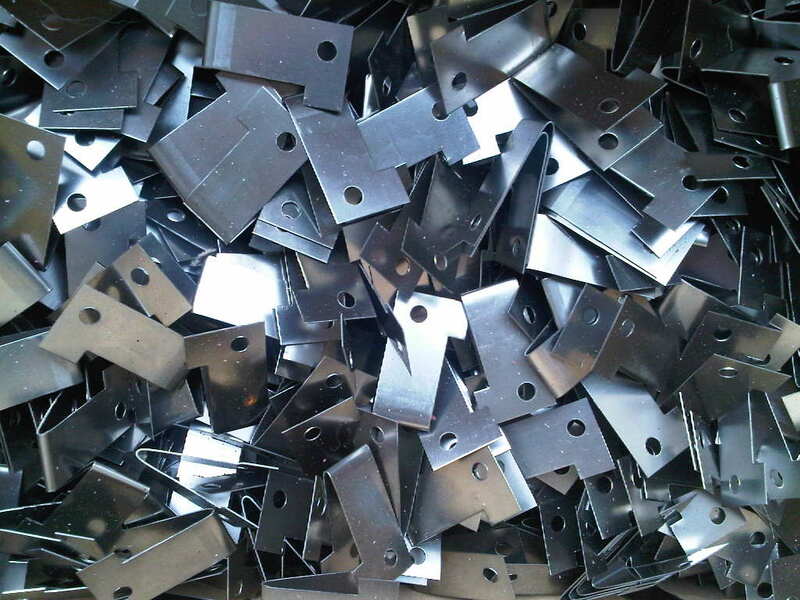 This shear angle can also help to reduce the amount of stress and deformation experienced within the sheet metal component itself. The punch and die may be of any desired shape, so odd shaped holes and cut outs can be created when required with relative ease once a fly press tool has been manufactured. 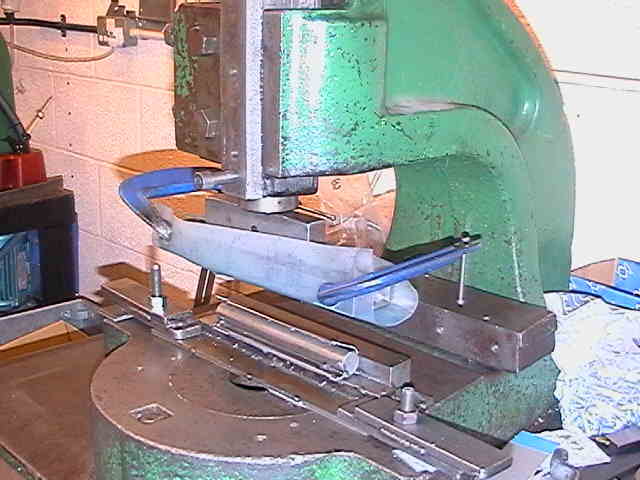 This action is the same as that employed on the much faster CNC punch presses but the fly presses are purely manually controlled with the operator positioning the work piece against some defined side and ends tops and on conventional fly presses swinging a handle to provide the punching force. On our fly presses we have had them converted with 9 tonne hydraulic rams. These hydraulic ram packs enable the operator to be more consistent with the force used in the work cycle (helpful when forming is required, e.g. countersink forms) and it reduces operator fatigue when a large batch of sheet metal work might be needed. We use fly presses for a variety of sheet metal work operations in our factories in Fareham, Hampshire including coining, pressing in large anchor rivet bushes and studs, pressings with small press tools, punching various sized holes in sheet metal and extrusions, forming hooks, pressing small joggles, piercing spring stainless steel, corner notching, corner radiusing, stamping in part numbers / logos and adding hole modifications to existing sheet metal work to name just a few applications. You can see on the featured image a simple diameter 3.5mm punch and die set ready for piercing. The 3 images on the right illustrate the stages in forming a riveted joint in a pivot arm manufactured from Zintec sheet metal and using hollow zinc plated rivets. The bottom image shows some typical sheet metal spring steel clips used to hold a light fitting in place in a wall cavity.